When I was a kid my local music store stocked one brand of guitar string, Black Diamond. I had two choices for string gauge. Although they were probably called “Medium” and “Heavy” they were in fact heavy and heavier. There was no distinction between acoustic and electric guitar strings. Steel or nylon were the choices for composition. I don’t want to imply there weren’t other types of strings fifty years ago – there were but I couldn’t have proved it then. There was no internet, no mail order strings and choices were often limited. Things have obviously changed. I just looked at my favorite online string merchant, JustStrings.com, and they listed 32 different makers of acoustic strings for steel string guitars. Although I’ve found the widest selection of strings at JustStrings.com, there are brands of strings that they don’t carry. With so many choices I can’t review everything. But I am going to see if I can illustrate some of the differences among strings available today. Some guitarists are great experimenters with their setups. When I get a new guitar I’ll usually try a variety of different types of strings on it too see which makes it sound best. Yet most of us, even if we are experimenters, stick to what we know. My goto string has been D’Addario for many years. That wasn’t always so. 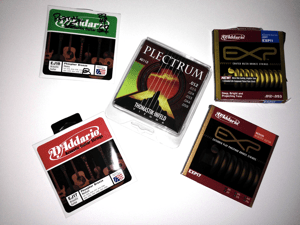 I used to favor Martin strings but once when I couldn’t find them at a local store after a broken string incident, I tried D’Addario and liked them better. You can’t try everything. There are just too many choices. But if you’re unhappy, try some new strings. Many address specific problems and you might be surprised. The basic design of guitar strings are two plain steel strings for the 1st and 2nd string and a solid steel core wrapped with metal for the wound strings. The wound core can be hexagonal or round in shape. Most of the differences in strings are because of what is used to wrap the wound strings, whether the wound strings are polished and whether the strings are coated or treated to make them last longer. 80/20 Bronze. 80/20 Bronze strings are made from 80% copper and 20% zinc commonly known as Bronze. D’Addario has been making Bronze acoustic guitar strings since the 1930s. Catalog numbers for these basic strings range from EJ10 to EJ14, representing different gauge combinations in the set. EJ36 is a 12-string guitar set. One of the nice things about D’Addario is they publish gauges and tensions for almost all their guitar strings. For reference, the tension of the low E (6th string) ranges from 19 to 27 pounds. 80/20 Silk and Steel. “Slik” and steel strings use nylon (or other material) either intermixed with the metallic wrap or as the core of the wound strings. The result is a smoother string with less tension. Using an 80 / 20 bronze wrap is fairly unusual but it also makes the string interesting. 80 / 20 Bronze, Coated Strings. These are one of my favorite strings. I had used the EJ 80 / 20 Bronze strings on my Martin acoustic guitar. I liked the tone but they went dead fairly rapidly and I needed to change strings often to get that new string tone. I’m embarrassed to say how long I leave these EXP strings on my guitar (more than a year once). They still sound good. There are newer and perhaps better (perhaps not) coatings available now. But when I first tried the EXP series it was the first coated string I’d found that didn’t feel or sound different than the uncoated version of the string. 80 / 20 Flexible Core. The innovation for the Martin FX strings is to use a thinner core wire than is normally used for the wound strings. This results in a more flexible or elastic string. Similar to the silk and steel, the softer feeling string appeals to some fingerstyle players. This probably has a brighter tone than the Earthtone 80 / 20 Silk and Steel – but I haven’t tried either on any of the guitars I currently own (but may try some of these soon on a parlor guitar I like). Phosphor Bronze (standard). Since D’Addario claims the invention of the modern phosphor bronze guitar string I felt it fair to start with their offering. The composition of phosphor bronze is 92% Copper and 8% Tin with phosphor added. D’Addario refers to these as the first long-life string technology. They last longer than the typical 80 / 20 bronze string set. Flat Tops. Flat tops are the name D’Addario gives to it’s phosphor bronze strings that have been polished so the outer wrap on the wound strings is smoother. One of the items many guitarists look for is great sound with less string noise from fingers rubbing on the strings. It’s a difficult problem to solve because many of the technological tricks to reduce string noise also make the strings sound duller. This is a compromise but is probably better than flat wound or silk and steel strings regarding brightness. Nanoweb Strings. Elixer was one of the first companies to make treated strings to prolong their life. Their earliest strings were loved by some but many thought they didn’t feel or sound the way they expected. Newer formulations improved this. I had tried the early strings and didn’t like them. I’ve heard good reports about them since then but once I found D’Addario EXP strings I stopped looking. Cleartone. Cleartone is another company making coated strings. I’ve heard good things about their coating and strings but again, I haven’t tried them personally. Blue Steel. Dean Markley treats these 92% Copper, 8% Zincsstrings in liquid nitrogen (cryogenic). They allege that this removes microscopic gaps in the string and improves the sound. I think there must be something to it because this would be an expensive process if it were only a marketing gimmick. However, I have not tried these. Have you? Silk and Steel. These strings are wound with silver plated copper wire over silk and steel core. It’s another variation of many for silk and steel strings which feel softer and sound more mellow than traditional formulations. Gypsy Jazz Strings. Silk and steel strings are also popular for Gypsy Jazz. The Grande Bouche and Petite Bouche guitars used for Gypsy jazz typically used loop end strings instead of ball ends as most steel strings have. If you are buying Silk and Steel sets, make sure the ends match your guitar. Monel Acoustic Strings. Martin Guitar makes Tony Rice Signature Bluegrass strings. These are made from the Nickel based alloy, Monel. Monel had been used by Gibson starting in the 1930’s. It has a high copper content, but not as high as 80 / 20 Bronze strings. Monel can still be found in flat wound guitar and bass strings, e.g. from RotoSound. The big online instrument stores don’t seem to carry the Martin Tony Rice strings but you can get them at JustStrings.com. Double Wrapped Strings. Newtone makes an acoustic string with a double wrap on the wound strings. These are called their Master Class Double Wound strings. They are made from phosphor bronze . They are described as being warmer and more mellow. The feel is smoother with less string noise from your fingers. You can buy these from Juststrings.com.